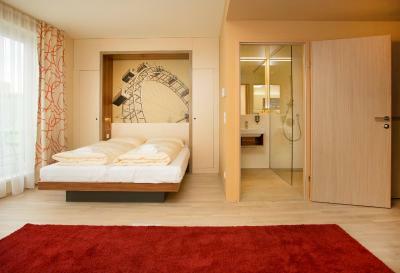 Lock in a great price for JUFA Hotel Wien – rated 8.5 by recent guests! 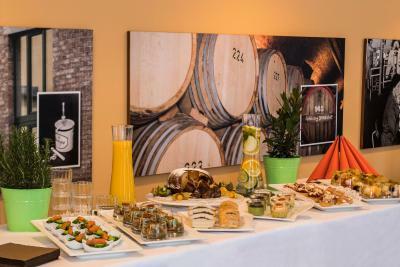 The food was great, staff were extremely helpful, and it had children’s activities on property. Traveling with child JUFA was the best choice. Felt very safe, excellent breakfast, U-bahn only 5min walk. Great value for money, great staff. The room was very clean and comfortable. Everything is great as usually. It has parking garage. We traveled with family for skiing and did not intend to see city center. Location was good for one night stopover. 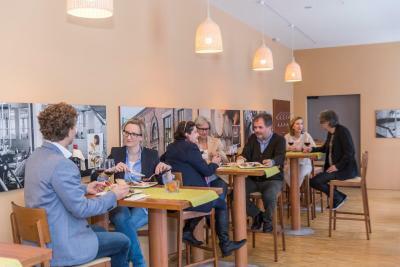 Having their own cafeteria 24/7 is great, as finding place to eat after working hours can be challenging. Free on street parking was handy as well, and you can also use inside garage for a small fee. Excellent location in the cozy district not far from the city center. Friendly and helpful staff & extremely tasty breakfasts made the stay just perfect! The location was good. Close to metro station and tram stop. It is close to airport as well. We could easily find all kind of shops for everything around. Breakfast was pretty good for money. The lobby was interesting. There was a small room for kids/teens which contains a bunch of box games and a big foosball table. My son enjoyed it. 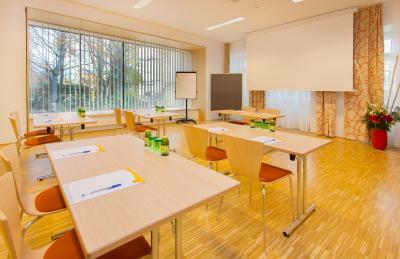 The rooms were very contemporary. The lobby was very large and clean and the front desk staff were exceptional! 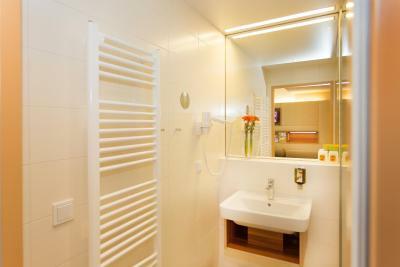 I also liked the separate toilet and sink/shower rooms. 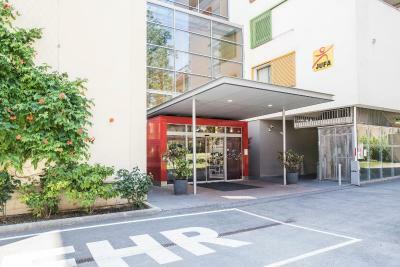 JUFA Hotel Wien This rating is a reflection of how the property compares to the industry standard when it comes to price, facilities and services available. It's based on a self-evaluation by the property. Use this rating to help choose your stay! 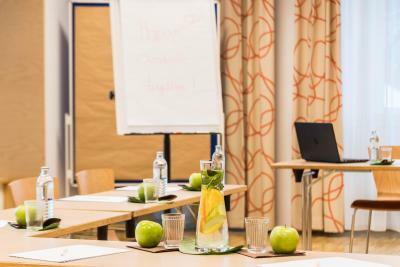 JUFA Hotel Wien is located 800 feet from the Enkplatz Underground Station in Simmering (Grillgasse exit) and offers modern rooms and an atrium lounge. It also offers buggy rental services and free WiFi in all areas. 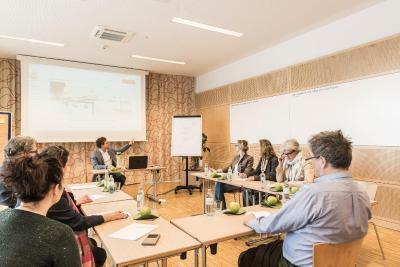 The on-site restaurant offers a rich breakfast buffet, homemade dishes, and, in good weather conditions, barbecue specialties which can be enjoyed on the terrace as well. 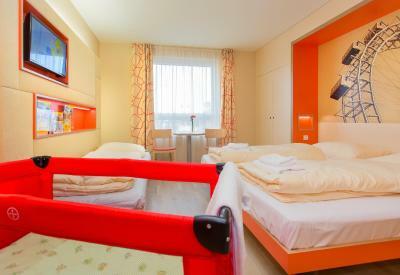 Every room at JUFA Wien is anti-allergenic and has air conditioning, a bathroom, a seating area and a TV. Suites come with a balcony or terrace. A games area and a playground will entertain younger guests, and there is also a youth area with tabletop football facilities. 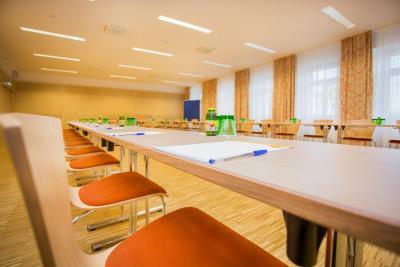 Special facilities include rooms for disabled guests and mother and child friendly parking spaces (surcharge). Free parking spaces can be found in front of the building, while garage parking spaces are available for an extra charge. St. Stephen's Cathedral can be reached by public transport in less than 15 minutes. Parks, cafés and restaurants are within a 10-minute walk. 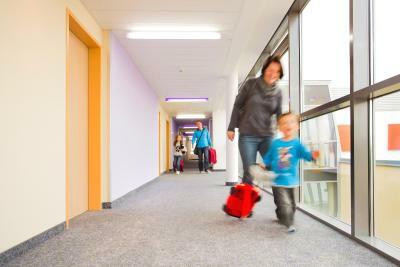 Vienna International Airport is a 20-minute drive away. 11. Simmering is a great choice for travelers interested in convenient public transportation, sightseeing and city walks. 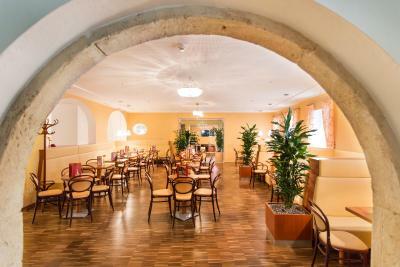 When would you like to stay at JUFA Hotel Wien? This room has air conditioning, a sitting area and city views. With air conditioning, a sitting area and city views. With air conditioning, a sitting area and TV. 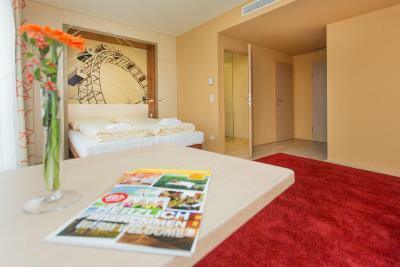 Spacious suite with air conditioning, a sitting area and TV. These units also have a terrace or balcony. 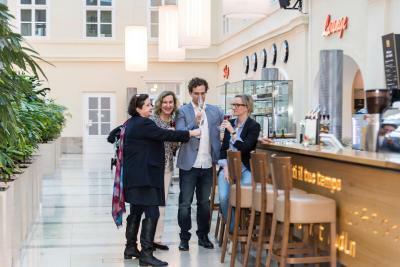 House Rules JUFA Hotel Wien takes special requests – add in the next step! JUFA Hotel Wien accepts these cards and reserves the right to temporarily hold an amount prior to arrival. Please inform the property in advance if you will be arriving outside reception opening hours. Please note that if you book 5 or more rooms or for 10 or more guests, different policies and additional supplements may apply. Please note that on-site parking is limited and subject to availability. A parking space cannot be guaranteed in advance. Please note that construction works currently take place near the hotel. Guests may experience some noise or light disturbances. Please note further that breakfast and dinner for children from 4 to 15 years cost 8.20 Euro and 8.90 Euro respectively. The main inconvenience is that the hotel is far from the city centre. Very nice and light atrium style lobby. The room was clean. 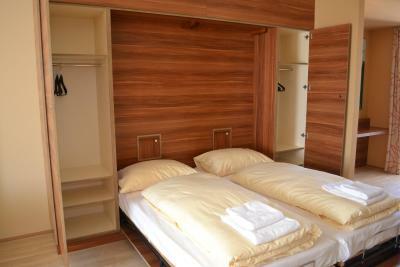 The size of the room is sufficient for the stay of the family of 4 persons. The buffet style dinner in the hotel's restaurant was great and with a viriety of tasty dishces. Location poor - up small side street in a construction area, construction debris in front of the entrance. Taxi drivers took awhile to find it. Our stay would have been enhanced by the provision of tea and coffee making facilities in our room. 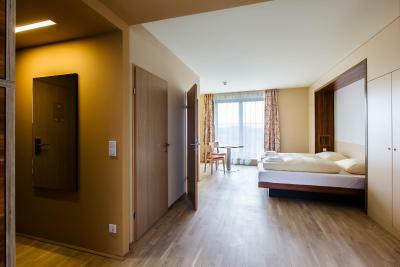 Very spacious and very clean with very comfortable beds and a very adequate breakfast. Staff were friendly and polite.. The room was incredibly warm and we couldn’t turn on the AC or lower the temperature even when we tried a million times. Also it was smaller than expected. 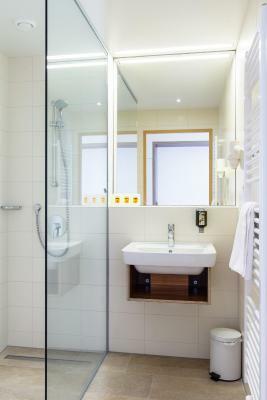 Toilet and shower were separated, but the sink was only available in the bathroom. 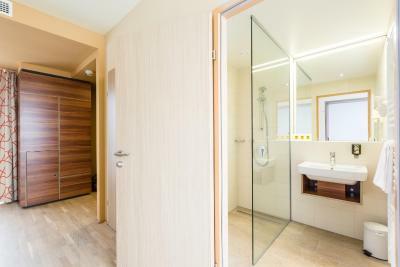 Large room , separated toilet and shower rooms. There have game room for children and leaflets for children 's activities. Far from center. Weird design. Small rooms. Close to the metro. Cheaper than other hotels. Dinner buffet was ok. There is neither kettle nor cups in the room. Our room had only a "window" with an atrium view. It was locked so in the room was no fresh air and very poor daylight. The price was about 0,5 Euro lower than the rooms with a proper window, so I didn't notice the difference. I think this kind of room should be cheaper. 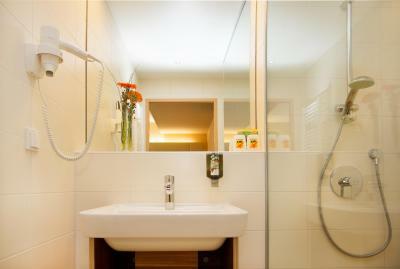 Close to metro station, clean, separate toilet and the bathroom. Nice breakfast. Minibar have nothing just water .. In the midle of factories, so not a realy place for a morning walk, but just for owernight perfect!!! Very clean and very quiet /we were there saturday/sunday/ hotel. Spent a night with two children 6 and 8. very happy what we get. Nice clean place. Very good stuf. Rooms are well sound proof so we had nice sleep. Breakfast a bit expensive and 12 Euro a day parking. Atrium, staff, room....funky. felt like loads of space given atrium. Local area not that good, but easy walk to underground.